Scroll to the bottom of the page for more information on activity prices and online booking at Harbor Mall. The new Harbor Mall in Pattaya is marketed as The Family Paradise, they boldly proclaim it is the biggest family entertainment center in the ASEAN. There’s lots of what you expect to find in a modern shopping mall, lots of shops, restaurants and a super-market. 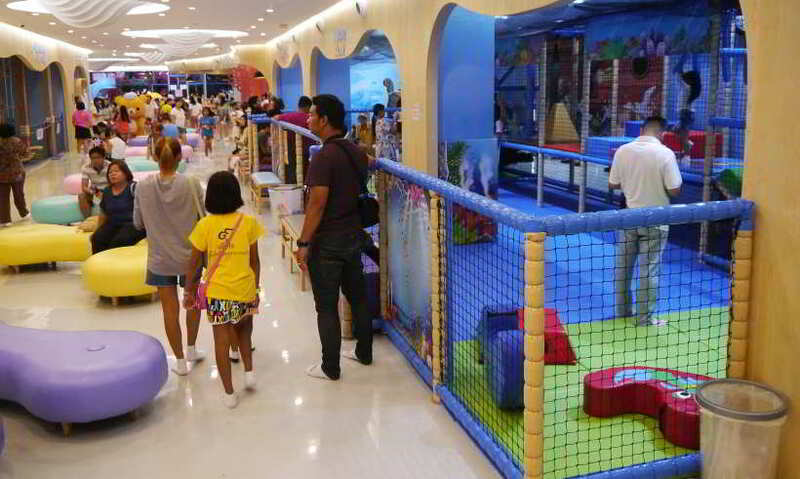 It’s not unusual to find some form of family entertainment in Pattaya shopping malls. Royal Garden Plaza has a Ripleys, Louis Tussaud’s and a 3D cinema. The Avenue mall and Central Festival Beach mall have a cinema and tenpin bowling. My own children often ask to visit Central Festival which also boasts a Mario Land and several other children’s activities. Harbor Mall have a dedicated a large proportion of floor space to a variety of amusements, many of which are new to Pattaya. 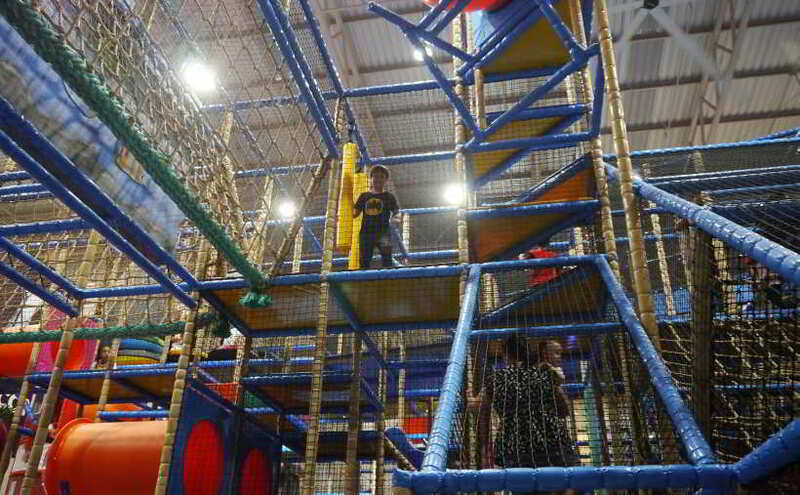 They include ice skating, trampoline park, rock climbing wall and an indoor adventure playground. Harbor Land (see photos below) is an activity center for all age groups, from toddlers to young teenagers. Activities include painting and drawing, karaoke, basketball, toddlers obstacle course and swings. The main attraction at Harbor Land is the adventure playground, a labyrinth of rope bridges, slides and climbing frames. Harbor Land children’s adventure playground. 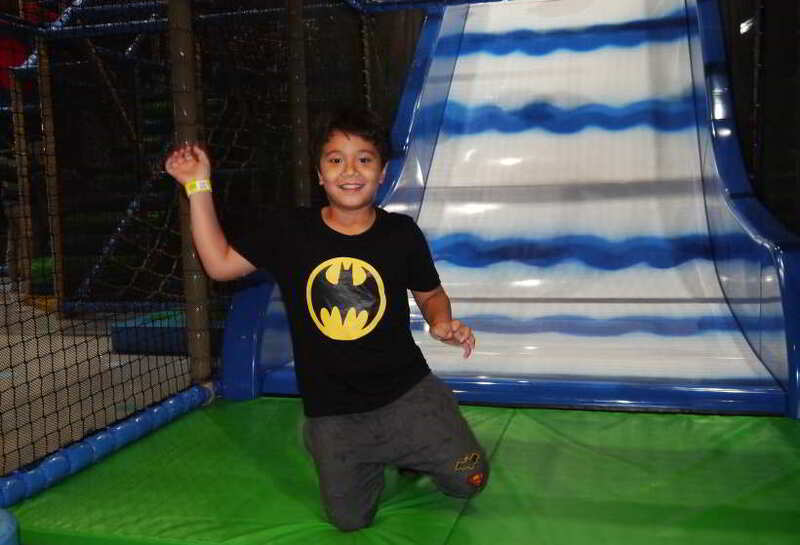 Harbor Land is great fun for young children, my 8 year old son loves it. At 280 baht for 3 hours per child I think it is quite reasonably priced. What I don’t think is reasonable is paying 150 baht per adult for the privilege of watching your children play, and on top of that you must each buy a pair of socks costing 60 baht per pair. The prices vary from one activity to the next. Activities for toddlers are generally cheaper. There are also discount combination tickets available, both inside the mall, and online. You can find the current rates for single activities on harborlandgroup.com. How to get to Harbor Mall in Pattaya: Harbor Mall is located on Central Pattaya (klang) Road. Use this Harbor Mall Google map to get directions to Harbor Mall. You can easily reach Harbor Mall using public transport, read this Getting Around Pattaya guide and learn how to use public transport in Pattaya. Is Pattaya Suitable for Children? Get cheap tickets to attractions in Pattaya.